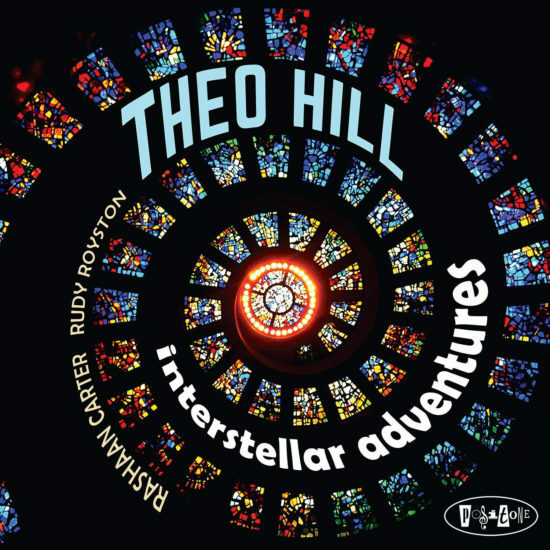 "Interstellar Adventures," by pianist Theo Hill. Interstellar Adventures makes good on the promise displayed on 2017’s Promethean, the young pianist’s debut for Posi-Tone, and 2015’s Live at Smalls, his first as a leader. It also far surpasses them in originality and pluck. Where the earlier outings, particularly Promethean, showed Hill to be an imaginative player with one eye focused keenly on tradition and the other eagerly searching beyond it, the new set finds Hill increasingly willing to burn bridges with his influences and carve out his own territory. Like its predecessor, the new release is a trio recording, with Rashaan Carter playing basses and Rudy Royston drums. Half of its 10 tracks are penned solely by Hill, including the opening title track, which eases in cautiously, allowing the group to find its way around the melody before agreeing to embellish and discard as needed. Hill’s “Gyre” skitters, slashes and sways, leaving Carter and especially Royston to their own devices as the pianist, in an absorbing solo section, offers transitory single-note suggestions he may or may not choose to stick with very long. It’s almost giddy in its gleeful execution, balancing mathematical precision with frenzied abandon. Of the covers, Tony Williams’ “Black Comedy” and Jan Hammer’s “Thorn of a White Rose” are corkers. Hill isn’t one to use velocity for its own sake; when he does, as in the former, he dazzles but his point isn’t so much to pat his own back as to keep the tune in constant forward motion. Royston, on the latter, nods to the megaton drumming of Elvin Jones, who cut the tune four decades earlier, but he never loses sight of the new places Hill and Carter opt to take it. Preview, buy or download Interstellar Adventures on Amazon.